The complex design of this large cover (it measures over six feet on each side) is composed of a series of repeating forms. Although woven in the Andes, it is similar to Ming textiles from China (1368-1644), which also include peony flowers and mythical beasts. The cover also displays crowned lions that derive from European imagery and, unique to Andean tradition, frolicking llamas. As an ensemble, the animal kingdom and flora on this textile suggest the kind of visual and cultural complexity desired by, and created for, wealthy residents of viceregal Peru. The red background of this cover resonates with many traditions. For instance, red was a highly valued color in the pre-Hispanic Andes because of its rarity: the dye came from cochineal and was not easy to procure. Red was also often the background color in certain Chinese textiles, where it carried connotations of auspiciousness and happiness. 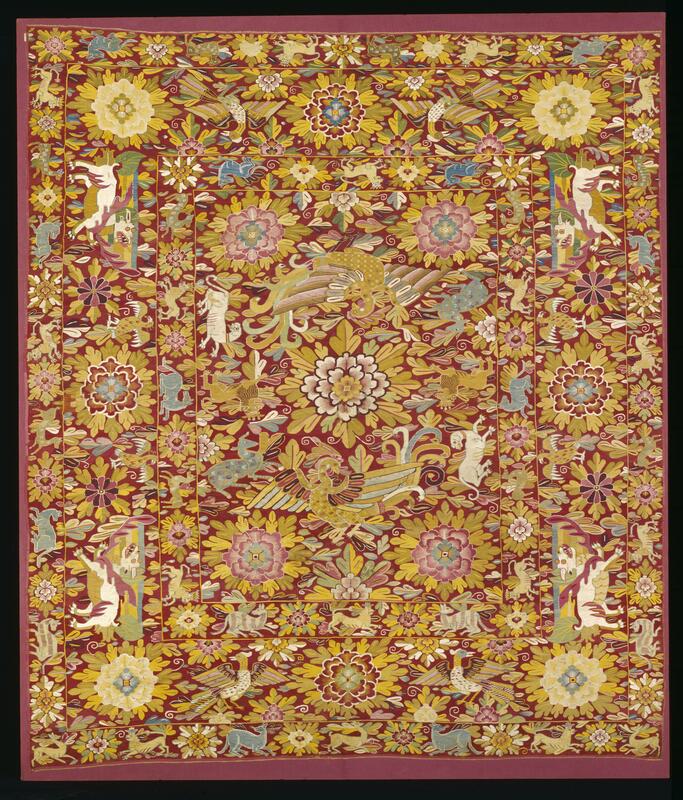 In the rectangular band around the central field, llamas of blue and green appear the textile, juxtaposed with small peonies and crowned lions. Peonies were a flower prized in China, but not native to the Andes. Here, their presence reveals that weavers in viceregal Peru knew of (if not owned) Chinese textiles and images. Dragon-like beasts, known as xiezhi, seen near the four corners, gored the wicked and spared the good. These horned animals appeared in the clothing worn by officials in the Ming Dynasty in China (1368-1644). By the time this textile was woven, the Ming Dynasty had fallen but objects and images from China remained popular in Peru. The birds on the cover do not represent any specific species, although they probably have their origins in both Andean and European imagery. This elegant textile was likely woven in a textile workshop or by master weavers who specialized in textiles of this type. Their names are not known, as textiles are almost always anonymous productions. The cover was woven of cotton (warp) with linen, wool, and silk wefts. The diversity of materials—especially silk and linen-—speaks not only to the expense of this object, but also to the skills of Andean weavers who would have had to manipulate threads of different densities, textures, and elasticity. The original context of this textile is not known. It would have been an expensive piece, most certainly intended for the house of a wealthy person, where it might have covered a table or bed. Today it resides in the Museum of Fine Arts, Boston. 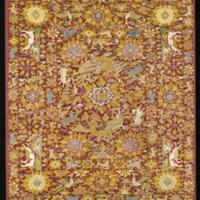 Peru was introduced to Chinese silk tapestries and embroideries via trade with the Philippines. From Manila to Acapulco, and ultimately to Spain, this was the route that objects traced from Asia to Europe. After 1580, the Spanish government banned trade between Asia and Peru. Nevertheless, Andeans were still able to trade for Asian goods through middle-men and markets not officially sanctioned by the crown. This textile reveals that Chinese materials and images not only made their way to the Andes, but they were also influential in the production of high-status textiles. In the homes of the wealthy as well as churches, elaborate textiles such as this one, which required artisans to draw upon and fuse multiple models and materials, were proudly displayed. Courtesy, Museum of Fine Arts, Boston. Reproduced with permission. © 2000 Museum of Fine Arts, Boston. All rights reserved. Cammann, Schuyler. 1964. "Chinese Influence in Colonial Peruvian Tapestries." Textile Museum Journal 1 (3): 21-34. Carr, Dennis, ed. 2015. Made in the Americas: The New World Discovers Asia. Boston: Museum of Fine Arts. Gisbert, Teresa, Silvia Arze, and Martha Cajías. 1987. Arte textil y mundo andino. La Paz: Gisbert y Cía. Niles, Susan. 1992. "Artist and Empire in Inca and Colonial Textiles." In To Weave for the Sun: Ancient Andean Textiles in the Museum of Fine Arts, Boston. Rebecca Stone-Miller, ed. New York: Thames and Hudson, 51-65. Phipps, Elena, Johanna Hecht, and Cristina Esteras Martin, eds. 2004. The Colonial Andes: Tapestries and Silverwork, 1530-1830. New York: Metropolitan Museum of Art. New Haven and London: Yale University Press.